I never feel closer to God than when I hold my granddaughter. 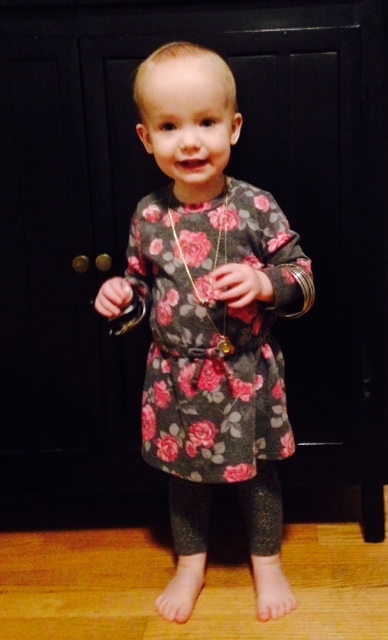 Ada, at nineteen months, is smart, loving, beautiful, and already has a wicked sense of humor. My afternoons with Ada are my best, happiest days…when I get the pleasure of her company for three to four hours, or more, if I’m lucky. During those hours, I call her “baby girl” and tell her I love her at least a hundred times. Afternoons, I let Ada lead the way. From what she wants to do to when she wants to eat. We have our favorite activities, and our rituals. First, we take off our socks and get down to bare feet. Maybe it’s the Southern woman in me, but I’ve never been a fan of shoes and socks…especially in the house. Ada’s either inherited that from me, or learned from example, but she insists on socks off right from the start. The day usually begins with This Little Piggy, to be repeated spontaneously over the next few hours. Another ritual Ada likes is wearing my jewelry. It started with a bracelet I wore early on to entertain/distract her when she got upset. Seven silver bands looped together are bright, shiny, and jangle when shaken. She insisted on wearing it. Soon, she added a necklace and another silver bracelet I always wear. Last week she added another necklace, my watch, Fitbit, and a ring. I’ll be leaving all my jewelry to Ada in my will! Thanks to her daddy, Ada loves watching football, and she has two of her own. We toss the football to each other and, when we catch it, we roll on the floor while I shout “going out for the pass!” She also likes to dribble a soccer ball and shoot a few hoops in her brand-new basketball net. Ada is clearly going to be an athlete of some kind. I’ve taught her some yoga. She watches closely and imitates my poses…reaching to the sky then touching our toes, downward dog, happy baby. Ada’s expert at happy baby! And I’ve changed the name of my corresponding pose to happy Grandma. We always spend time at the living room windows, watching traffic pass beneath us… counting busses, trucks, and motorcycles. Rushing to the window to see an ambulance or fire truck race past. Ada loves spotting trains in the distance, or planes and helicopters overhead. Ada loves the sky. She especially loves pointing to the moon. And, in her bedroom, we lie on the soft, gray, sheepskin rug and stare up at the “stars” on the base of her chandelier. Much of our time is spent in imaginary play. Picnics with her little people. Arranging and rearranging her menagerie of stuffed animals. Puppet shows. We draw, and color, and tell each other stories. I tell her about all the things that exist in the world…oceans and mountains and forests. Things I want to show her… the Eiffel Tower and Paris. Things I want to do with her… ride a train, see a ballet, attend the symphony. I tell her all the magical, wonderful things she will see and do. All the things she can be when she grows up. I speak in possibilities and tell her only the good stuff of life. Ada listens and absorbs and tells me her stories. They are long and elaborate, and I can’t always understand the plot, but I always get the message! Ada loves bubbles! Every week we make bubbles using homemade solution and a big, intricate wand. First, I wave the wand and Ada chases the bubbles. Sometimes popping them, sometimes catching them in her tiny hands. Then I hold her while she dips the wand in the solution and I spin her around so she can do it. We make a terrible mess on the kitchen floor, and exhaust ourselves laughing and chasing bubbles. Ada also loves sitting in a rocking chair and having me (repeatedly) sing The Eyes of Texas are Upon You, while holding a stuffed long-horn steer her daddy brought her back from a business trip to Dallas. Ada rocks, sings along, and strums on the small pink “banjo” I gave her for Christmas. The gift of the banjo was inspired by the verse someone’s in the kitchen with “Ada” strumming on the old banjo. Ada was fascinated by the word banjo. And, since I was once told I should “never even sing in church,” it’s a uniquely lovely gift to have someone request to hear me sing. There’s always music. We listen to Pandora…usually Adele station, sometimes Bob Seger, and we dance in the kitchen. We mostly fast dance and twirl around, but occasionally I love to hold Ada in my arms and waltz her around the floor to a favorite slow song…Unchained Melody, The House of the Rising Sun, Make You Feel My Love. A couple weeks ago, Joe Cocker’s version of You are So Beautiful to Me came on and I swooped Ada up to dance. When my kids were little, I used to sing that song to them every night after they said their prayers. Ada’s mom and dad chose it for their Mother ~ Son dance at their wedding. The last time I’d danced to it was that night in fall of 2012. As Ada and I danced, I saw our reflection in the tall dark window. I hugged her tightly, and cried a little bit… remembering. I held Ada until she squirmed to be let down. Toward the end of the day we settle down on the sofa to read books or watch Mr. Roger’s Neighborhood videos. It’s then, she loves to sit on my lap. She leans back against me and I lean in toward her and wrap my arms around her, absorbing her sturdy warmth, feeling her heartbeat. Sometimes I hold her feet, ever awestruck by the perfection of her tiny toes. I rest my face against the top of her head and smell her soft hair. I kiss her sweet cheeks. Never am I more present in my life than in those moments when I take in Ada with all my senses. When I am lost in her. In those moments, I am consumed with love…pure and true…Godlike in its joy. People speak of the wonders of being a grandparent, but there’s no way to understand until you feel it for yourself. Every grandparent I know thinks their grandchild is the very best…and they’re right! Because every grandchild is a gift of trust and innocence. Every grandchild is another chance to be the best you can be…another chance to get it right. Every grandchild is someone else to love unconditionally. Loving Ada makes me want to protect her and make sure she always knows how much she’s loved. Ada makes me want to be a better person, to be stronger, to stay healthy. Loving Ada makes me want to live forever so I can watch her grow into adulthood. She makes me want to be there for her in every way she ever needs, on every step of her journey. And I’ve promised her, I will. Thank you, as always, to my readers for your continued love and support. I’m especially grateful to those of you who purchased my book to give as gifts over the holidays. If anyone else wants to share East of Mecca with family or friends, I’ll be running a 99-cent promotion for Kindle ebooks through Sunday, January 21, and I will be donating 22% of all profits from this promotion to Mary Lou’s Place, a domestic violence shelter for survivors and their children, run by the Evanston YWCA. 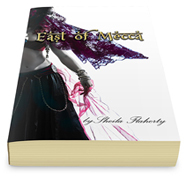 And, if you’d like to know what’s new with East of Mecca, please check out my list of East of Mecca Accomplishments for 2017! « New Year’s Eve Reflections and Gentle Suggestions	» And Then…Cancer. Thank you for sharing your moments with Ada, putting into words the feelings we grandparents thrive upon. Yes, each of us are left breathless when we experience the unconditional, pure, mostly indescribable emotion that overtakes us when we hold these precious little souls. Life’s golden moments, to be sure. By the way…Ada looks like you! In so many parts of your post I felt like you were speaking for me and my grandchildren in ways I could never so accurately and beautifully express. Sheila, your beautiful way with words has captured how we Grandma’s love is felt. I love reading your posts. Your Ada is so beautiful and so fortunate to have you as her Grandma. describing the indescribable, an experience of pure joy. Thanks, Anne! I can’t wait to see you and catch up.